Shane Lowry carded an opening round of 67. 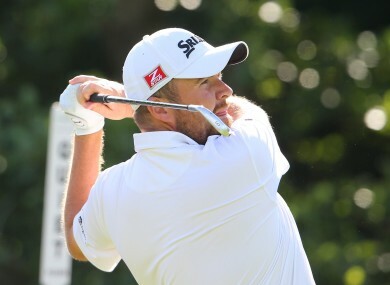 MICHAEL HOEY IS two off the lead, on -6, at the BMW International Open in Cologne. The Northern Irishman has followed up on a top 10 finish at the Irish Open last week with a superb start to a tournament that will net the winner €333,000. Starting on the 10th tee, Hoey birdied three of his first six holes. He has yet to drop a shot and picked up three more shots after the turn. Hoey has three holes to play [as of 3pm] and is a couple of shots back from England’s Danny Willett and Rafa Cabrera-Bello of Spain. Lowry carded five birdies and an eagle in a superb opening round of 67. Bogeys on four and 17 were the Offaly native’s only stumbles in a round good enough to put him in sight of the overnight lead. Lowry, who missed the Irish Open cut at Fota Island last week, got off to a flyer with birdies on two of his opening three holes. He reached the turn in -3 and his eagle arrived on the par five 13th. His pinnacle was a birdie on 15 to reach -6 but he dropped a shot on the penultimate hole. Fellow Irishmen Kevin Phelan [-4] and Damien McGrane [-3] are also in good form. Home favourite Martin Kaymer is back on -1 after an opening round of 71 and is a level with Ryder Cup captain, and Dubliner, Paul McGinley. Email “Lowry and Hoey in the hunt at €330k BMW International Open”. Feedback on “Lowry and Hoey in the hunt at €330k BMW International Open”.